Between 1800 and 1850, political demonstrations and the tumult of a ballooning street life not only brought novel kinds of crowds onto the streets of London, but also fundamentally changed British ideas about public and private space. The Crowd sets out to demonstrate the influence of these new crowds, riots, and demonstrations on the period's literature. John Plotz offers compelling readings of works by Thomas De Quincey, Thomas Carlyle, William Wordsworth, Maria Edgeworth, and Charlotte Bronte, arguing that new "representative" crowds became a potent rival for the representational claims of literary texts themselves. As rivals in representation, these crowds triggered important changes not simply in how these authors depicted crowds, but in their notions of public life and privacy in general. 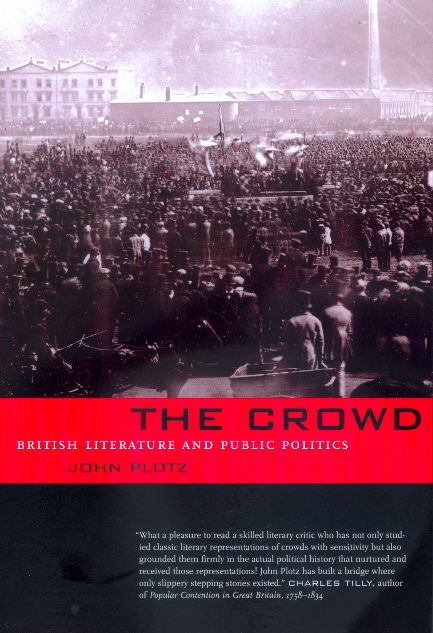 The Crowd is the first book devoted to an analysis of crowds in British literature. In addition to this being a noteworthy and innovative contribution to literary criticism, it addresses ongoing debates in political theory on the nature of the public-political realm and offers a new reading of the contested public discourses of class, nation, and gender. In the end, it provides a sophisticated and rich analysis of an important facet of the beginning of the modern age. John Plotz is Assistant Professor of English at the Johns Hopkins University. "This book studies the historical emergence of a certain kind of politicized crowd with an originality and a brilliance that will make it the definitive work on the crowd in nineteenth-century literature. "—John Kucich, author of Repression in Victorian Fiction: Charlotte Brontë, George Eliot and Charles Dickens and The Power of Lies: Transgression in Victorian Fiction. "This book will spark a great deal of debate, and debate of a far-reaching and desirable kind--perhaps even the sort of debate that has followed the similarly ambitious, paradigm-shifting work of people like D.A. Miller and Mary Poovey." —Bruce Robbins, author of The Servant's Hand: English Fiction from Below and Secular Vocation: Intellectuals, Professionalism, Culture.